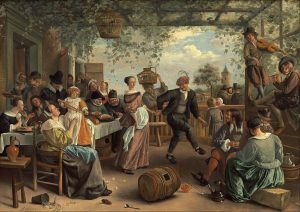 Jan Steen (1626-79) was a Flemish painter best known for his lively rendition of the everyday scene. Steen’s youth found him studying at the University of Leiden, but dropped out after two years to take a painter’s apprenticeship. He studied under the direction of Jan van Goyen, Nicholas Knupfer, and Adriane van Ostade. In 1648 he co-founded the Leiden guild of artists. His work is often referred to as a “comedy of manners,” satirical interpretations of contemporary society. Steen’s work focuses on the regular citizen, and many are titled by seemingly mundane activities when compared to the dramatic Italian works that preceded the Baroque era. 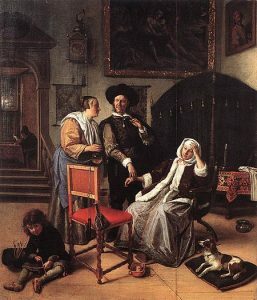 “The Dancing Couple,” “Doctors Visit,” “Adolf and Catharina Croeser on the Oude Delft,” and “The Happy Family” (pictured below) are all perfect examples showing where Steen’s interests lay. Steen has been described as “a man with no restraint” (riksmuseum.nl), and I can understand why biographers may describe him as so. In the 17th century painters were focusing on an authentic representation of human experience and form, and the audience would need some adjusting. For baroque artists, coming off the tail of mannerism, this would not have been an uncommon experience. However, in comparing his work even to others at the time I highly favor his work. If I were to compare him to someone like Caravaggio, I would say that they were complete opposites who complimented eachother. Caravaggio’s work was intense, precise, heartfelt and dramatic. Steen is heartfelt but joyful, simple, and full of life. Caravaggio’s characters seem to writhe in pain on each canvas, where Steen’s bustle with joyful activity. This is excellently displayed in the pieces displayed below. Additionally although Steen still worked in chairoscuro, it is because of the movement of the body and the joy of the characters that it affects each artists work so differently. 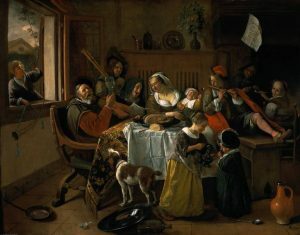 We see below Caravaggio’s Supper at Emous, and although it resembles a similar scene to Steen’s The Merry Familiy, the seperation in the two artists style is defined between these two pieces.